I will slowly update my journey to Seoul last 2 weeks. 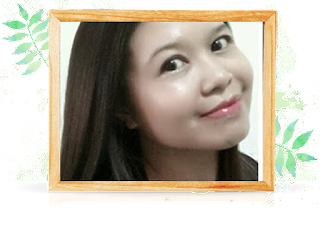 All photos need to be resize to suit this blogger.com size. OK...check out my feast during my journey to Seoul. 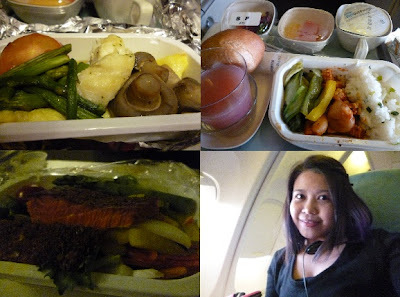 I was given seafood meal..special request! Even my late night snack came with smoke salmon salad ..OMO!!! This squid meal set is totally bless. I went to one restaurant..they just open because early in the morning. I saw they have photos and words in English. 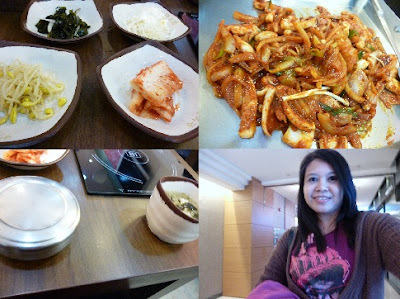 I then decided to try their spicy squid meal but don't know how to tell in Korean. I walked in to the restaurant. They greeted me ...Annyeong ha saeyo!!!! 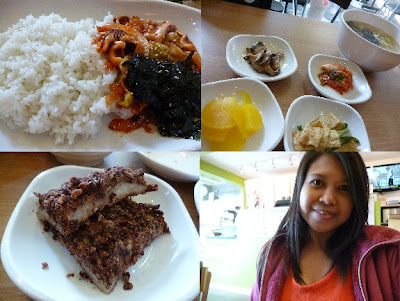 One Ajumma at kimbap counter. Rolling rolling rolling...yeah..that kimbab look like sushi. She gave me the menu.. I go...OMO! 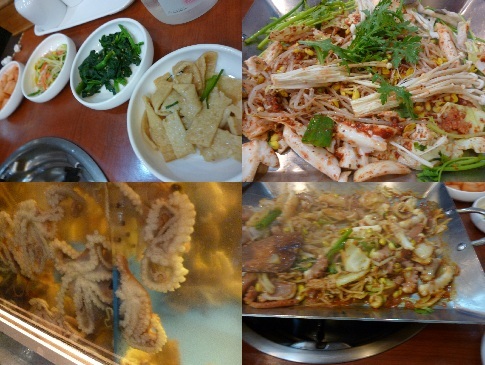 all in korean...no photo no picture...how am I going to point out my squid???? I look at her with a smile ...then scratch my not itchy head! Headache!!! then I got one idea. Ajumma understood and follow me out. There I pointed out to the photo display on the banner...then she said ok and nodded her head. Inside the shop I still need to ensure to her no pork in my meal. What I am trying say here...no pork but seafood ok!!!! Muahahahahaha.... with big laughter the ajumma seems to understand me. Whoa!!! 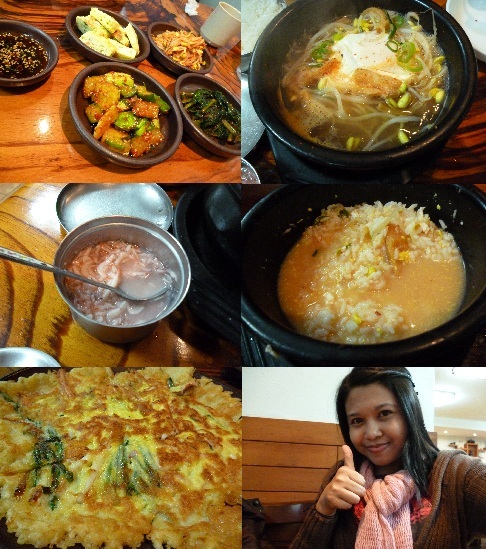 me sweating eat my first korean meal...which I odered !!! 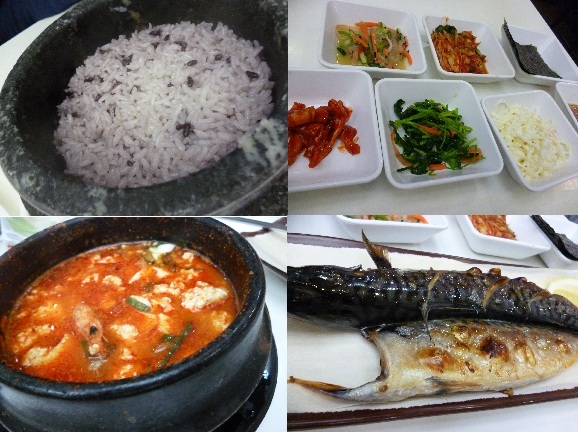 This grilled fish with spicy soft tofu seafood soup meal...not so difficult to order. This is 'HORROR' for the year! It was late for dinner and its raining day. Saw the octopus picture outside the restaurant. Then they heat up the stove in front of me. They put one plate full of vegies season with chilli flakes. They put one covered container at the side. I don't bother what is in that container. My mind keep wondering ....I thought I ordered octopus...where is it??? This is fried vegies only. open the mystery container lid. To my horror.... the live octopus is inside that container!!!! That Ajumma... lifted up the octopus high and grab a scissor...that octopus was alive....bloody hell!!!!! You can see the live octopus feet trying to run again...wiggle wiggle woggle on that hot plate. What kind of meal did I just ordered???? I looked away and waited patiently for the horror and torturous moment pass. My heart keep praying for the soul of that poor octopus. I ate all...but hurriedly walk to my hotel room and flush all down to toilet bowl. I against all cruelty.... if I follow my heart...I always wanted to be a vegetarian. But my body too weak to eat just that. This meal I label as Horror Meal!!! This one ...quite easy because just pointed out from the menu. After finish eating then only I realise I just ate PUFFER FISH. I thought it just a fish!!!! But to my amaze I just ate that puffer fish...you know that bloated with thorn fish. Since I use pointed techniques when I order so.......nobody to blame but me. my mistake...damage have been done...what an experience. 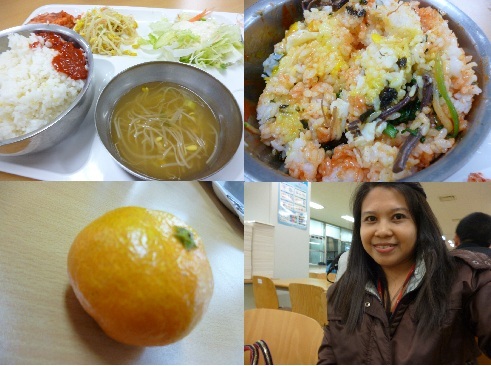 I was very pleased with this simple vegetarian bibimbap I ate during my DMZ tour. The dipping sauce was superb!!!! This one another pointing finger meal. I just pointed to the table next to me and I get this squid meal. This one was so good! Taste like our Sotong sambal here in Malaysia. My final night dinner in Seoul. I went for good treat for myself. The banchan was superb generous and all so super delicious. 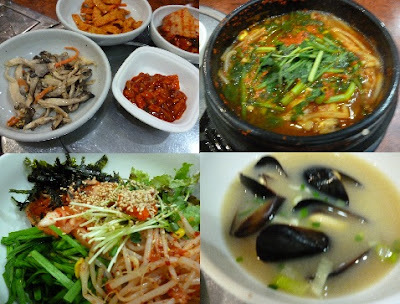 It was raining heavily outside...my hot meal...really give me a happy night!!!! Totally love this final dinner in Seoul. I will be back Seoul! 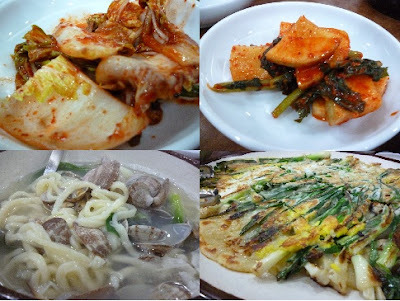 Next I will update on my street food and snack in Seoul...so keep visiting me...K! Tips for those who are travelling to other country which don't really speak English. Just be yourself and do a lot of smiling when inquiring something from them. Be humble!!!! Hellow Marissa!!!! hahaha I love to eat...sure will drop by soon.